I’ve been wanting to make homemade pasta for a while now and I finally got the chance this weekend. I had half a butternut squash in the fridge, some eggs and some flour, and I took this occasion to go to Reading Terminal Market in Philadelphia to get some quality cheese. 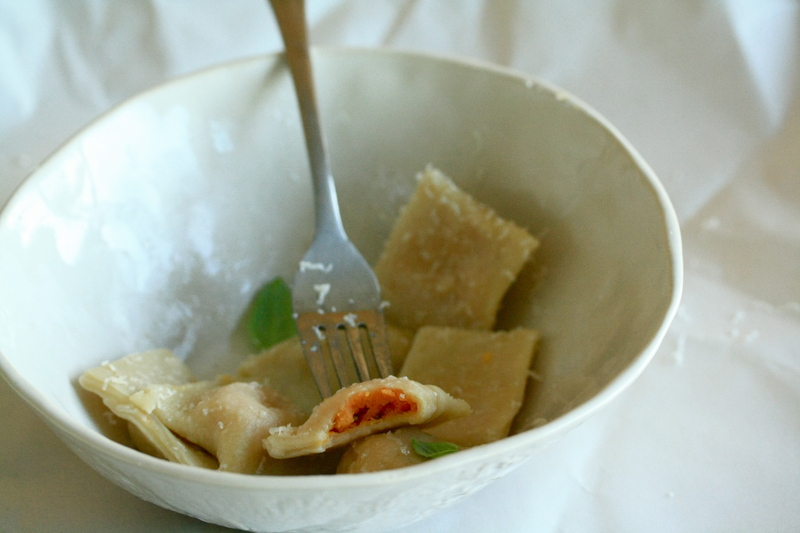 Because homemade pasta deserves quality cheese. 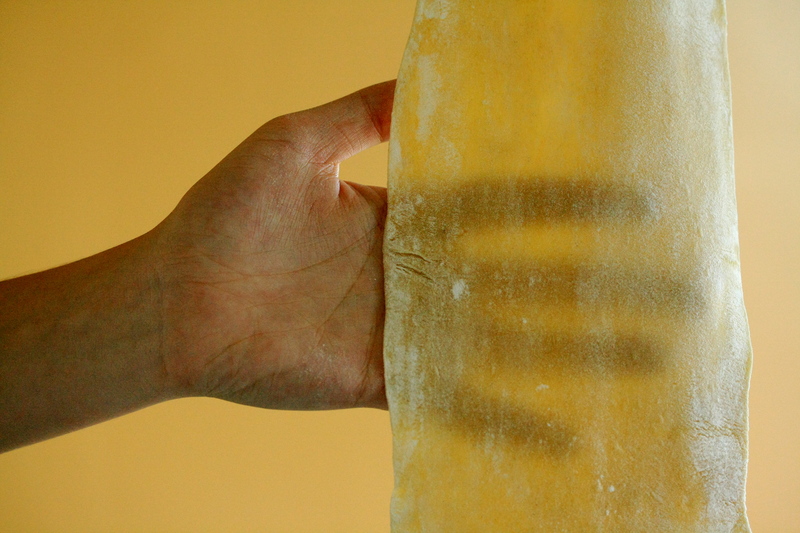 Homemade pasta is really not hard to make. 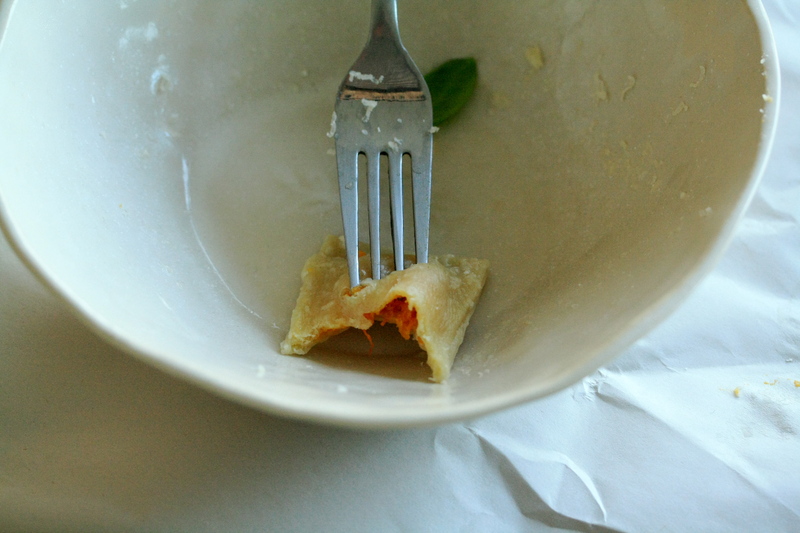 Sure, it takes longer to make than store-bought, but then again, convenience is the sole point of store-bought pasta. If you want pasta whose sole point is deliciousness, you should definitely take the couple of hours it takes to make these and do it. You will feel like a master chef afterwards. Heck, people might even start calling you master chef. 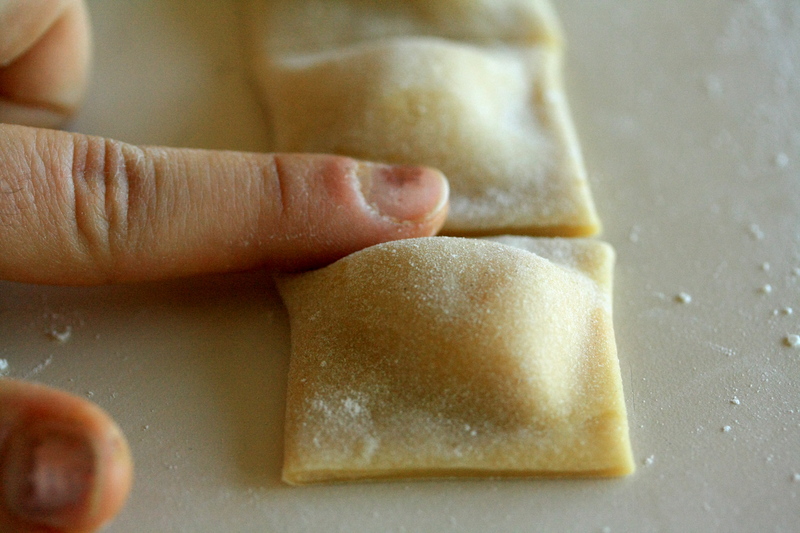 Make the pasta dough: In a large bowl, mix the flour with about a good pinch of salt. Form a well at the center of the flour and crack in the eggs. Mix it all together until you get a smooth, elastic ball or dough. If it feels too sticky, add a little flour until it is no longer sticky. Wrap the ball in plastic wrap and set it aside while you make the filling. The dough can be made 1 day ahead of time and conserved in the fridge. Make the filling: Preheat the oven to 350 degrees. Chop the butternut squash into large pieces and roast for about 30 minutes or until it is soft. Peel the squash and put it into a food processor with about 100g grated parmiggiano, the ricotta, 1/4 tsp cinnamon, and salt and pepper to taste. Process until smooth, taste and adjust as needed. 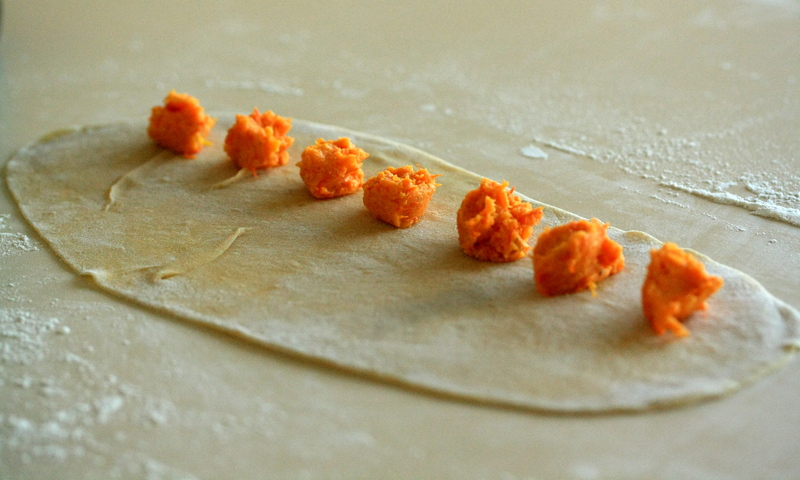 Assemble: Roll out the dough, pieces at a time, leaving the rest in the wrapped ball so it doesn’t dry out. Flour the surface you are rolling on liberally so it doesn’t stick. Roll it as thin as you can get it, thin enough that you can see your hand through it. 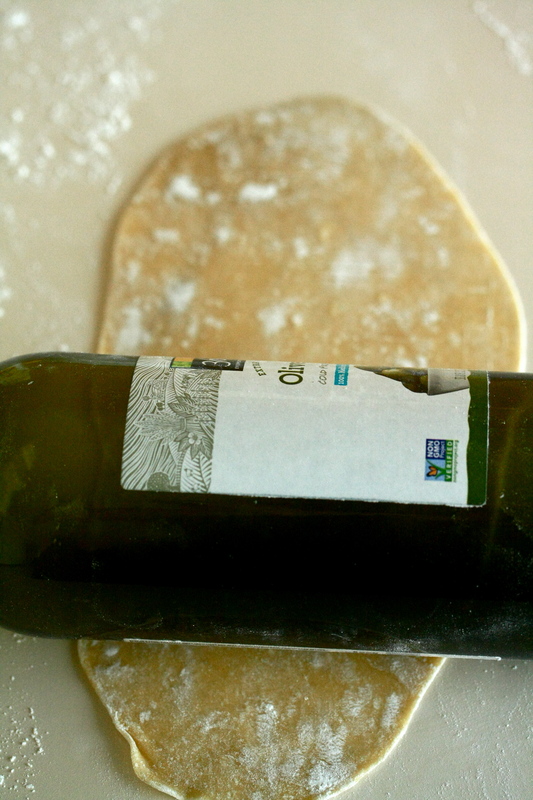 Don’t worry if you don’t have a pasta machine or even a rolling pin, I managed with an old bottle of olive oil! 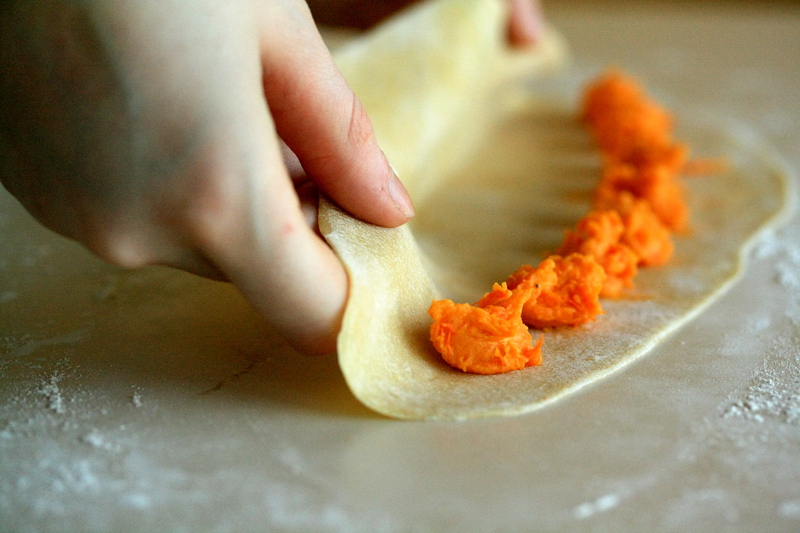 Once you have a long oblong shape, take teaspoon-fulls of the filling and drop them closer to one edge of the dough, spacing them about 2 cm apart. Lightly wet the edge of the dough where you will fold it over, then fold the dough over the filing and pinch around each dollop of filling. 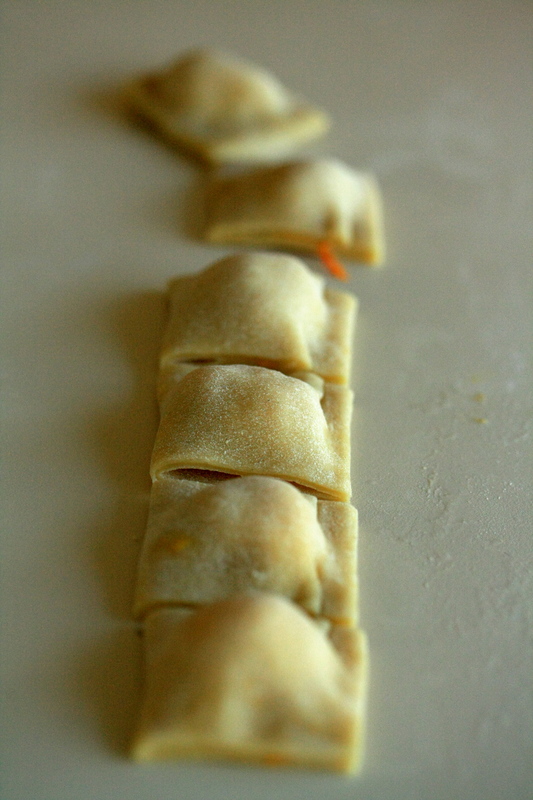 Cut the spaces between the dollops and make sure the edges of each tortello are sealed. 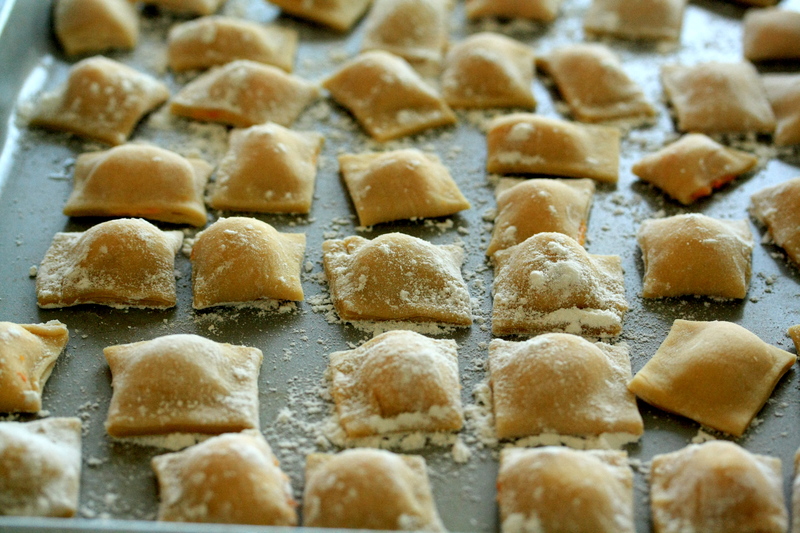 Bring a pot of water to a boil and boil the tortelli until tender, about 5-6 minutes. 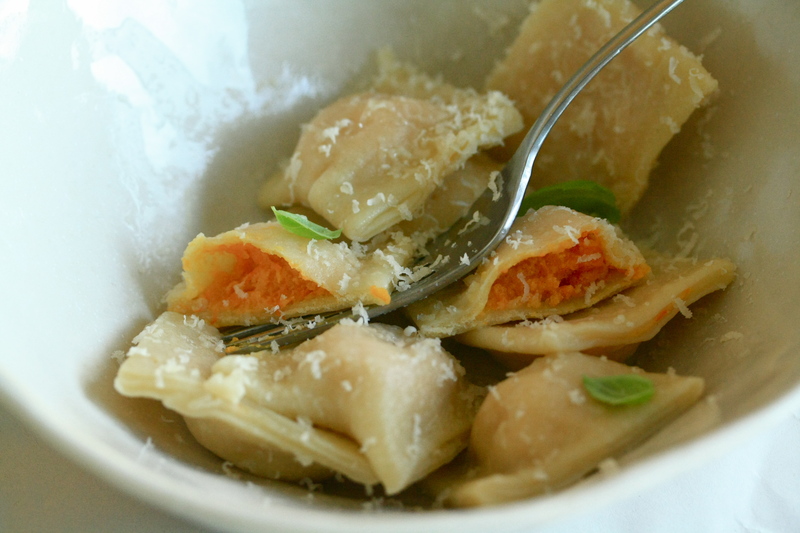 Serve them with a little sage-infused butter and a grating of parmiggiano cheese. Enjoy!